Back pain is very common – about 80 % people are affected by back pain. Back pain can occur at any age, but it’s most common in people between the ages of 32 and 58 onwards. Your spine/back , bones, joints,nerves,discs, muscles, ligaments and tendons. The spine, made up of 24 individual bones called vertebrae.There are also larger bones called the sacrum and coccyx at the base. 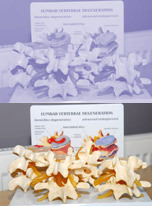 Between each vertebrae are inter vertebral discs little pads that act as shock absorbers, These flexible pads act by allowing your spine to bend in differing direction.As these discs stiffen they may reduce our flexibility. Your spinal cord flows through the central canal of each vertebra, carrying nerves from your brain to the rest of your body. With low back pain, you may have soreness,tension or an unusual amount stiffness in your lower back and hip area. In our experience at The Welwyn and Hatfield Practice pain is often referred to as ‘non-specific’ back pain can improve on its own within a few days but will often leave a degree of stiffness behind. These low grade repetitive back pains may gradually lead to inflexibility and further stress on disc structures. Back pain is medically called ‘acute’ or ‘chronic’ depending on how long the pains been there. Constant pain, particularly at night. Pain/ numbness down your arms possibly a trapped nerve .